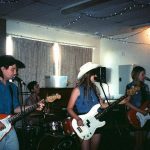 Just the other day I was rambling on with Internet fans about the best bands coming out of Australia/New Zealand these last few years…and I know for a fact that Terry were mentioned. Well, clearly they were reading our online banter, as the group just announced a brand new LP…with a catch new track. Like many great acts from the region, the band here balance scuzzy noise with savory sugar pop antics. There’s a musical meandering that closes the song that’s so ominous, those who jump right to it will likely think they’ve found a punk gem. But, there’s bubbling bass lines and sing-along chorus work to thrill! The group release I’m Terry on August 30th via Upset the Rhythm.